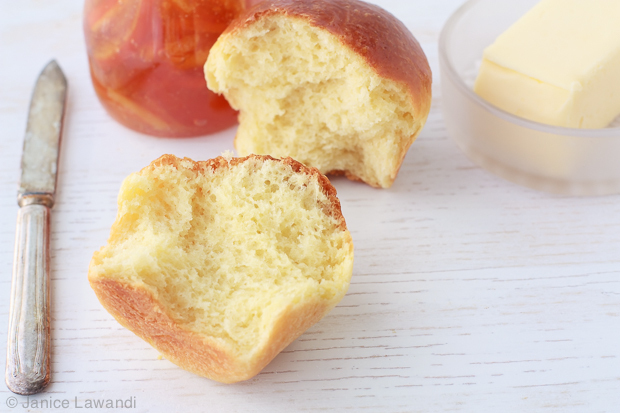 Brioche is a buttery bread usually served at breakfast, made from a yeasted dough enriched with eggs and lots of butter. 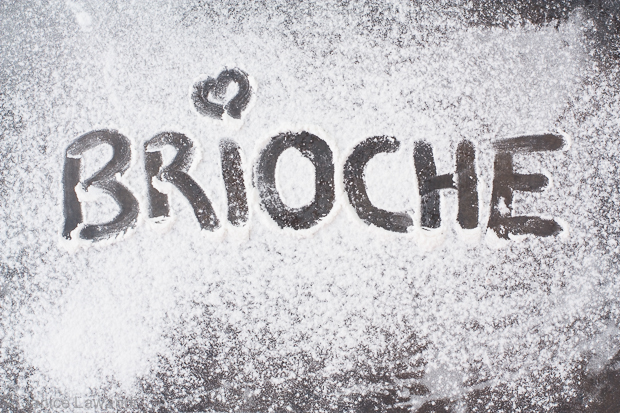 Here’s a recipe for how to make brioche bread at home. When I bite into a slice of homemade brioche, my mind immediately thinks of the luxuriously buttery taste of a croissant, but thankfully with a fraction of the work, and minus all the messy flakiness that gets all over the place. I still love croissants, but to me, a croissant is a “breakfast out” kind of treat, you know, out where somebody else does the vacuuming and the sweeping so I can be as messy as humanly possible. 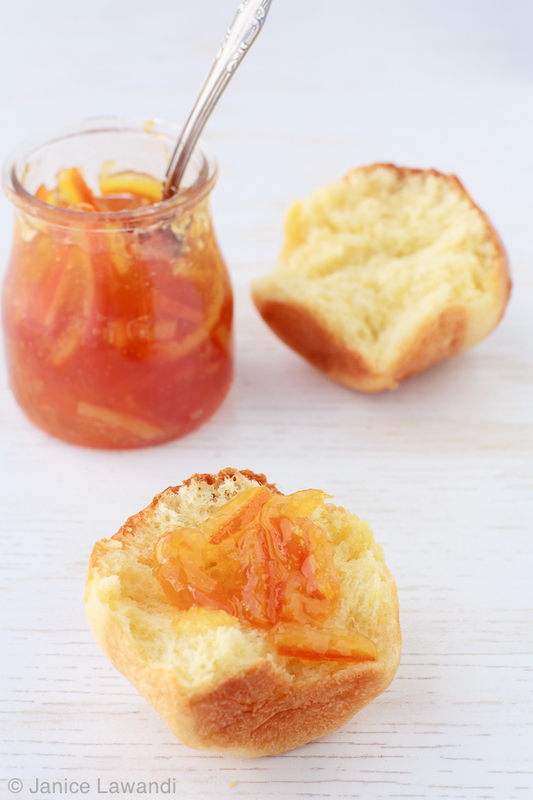 Brioche is for home and perfect paired with that a seasonal preserve, like three fruit marmalade in winter, rhubarb jam in spring, plum jam in summer, or apple jam in fall. Brioche plus jam is heaven. When I learned how to make brioche in pastry school, they taught us how to knead the dough by hand, but the French method for kneading brioche isn’t really how we traditionally picture kneading. Kneading brioche by hand wasn’t a gentle but firm massaging/folding of the dough with the palms of your hands. It was more of a slap that sucker down on the marble and scoop it back up, then repeat a million times until you’ve beaten that dough into submission. Imagine a kitchen with 15 pastry students slapping dough onto marble. It’s noisy, to say the least. It’s also seriously messy because before the dough has come together in a smooth cooperative mass, there are stages where it is a loose, disgruntled mess, so bits fly all over the place as you slap it onto the counter. Chunks of dough make it up to the ceiling and possibly into your hair. This kind of kneading isn’t really for the home kitchen, well, unless you like to clean dough off of your light fixtures. I got a ridiculous amount of pleasure “kneading” dough using the slap and scoop method in school, but these days, my breads are kneaded in my good old KitchenAid mixer (Amazon). This allows me to do the dishes while the mixer does the hard labor. And although I love unleashing my stresses onto a poor unsuspecting mass of dough, I have no desire to go searching for that rogue bit of dough that somehow got lost or mixed into a few strands of my ponytail. 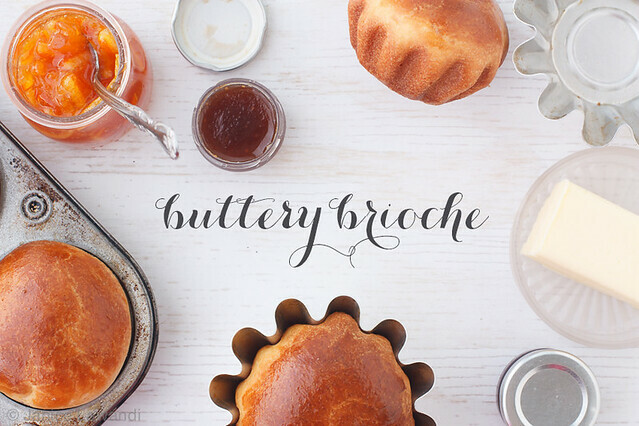 This brioche is a two-day process and therefore requires some planning, but don’t let this stop you: it’s not a laborious two days of never-ending work. The mixer does all the difficult kneading, and then for the first rise, I honestly let the dough be while I went to the gym. The first rise could take an hour if your kitchen is warm, or it could take 3 hours if your kitchen is cold like mine (or if you’ve over-kneaded the dough, the first rise might also take a little longer). Best to mark the bowl to make sure you can keep track of its progress. When the first rise is done, you deflate the dough and stick it in the fridge ’til morning. Easy peasy. The last rise, after you’ve formed the rounds of brioche, can also take a little more time than you’d expect because the dough is fridge-cold, and it first needs to warm up a bit before it can expand, especially since brioche dough is loaded with butter. I do the second rise in the oven, but with the oven turned off and just the light on inside. The light warms the oven just slightly, enough to coax the dough back to life. Sure, brioche might take two days to make, but this bread, freshly baked, is worth all that time and more. It’s buttery delicious, and would be the perfect edition to your weekend brunch, especially because you make the dough the day before and let it rest overnight in the fridge. And if you want to take your brioche to the next level, try these maple brioche buns, which are shaped like flowers. Brioche might take two days to make, but this bread, freshly baked, is worth all that time and more. It’s buttery delicious, and would be the perfect edition to your weekend brunch, especially because you make the dough the day before and let it rest overnight in the fridge. First, start by hydrating the yeast by stirring it with the warm milk in the bowl of an electric mixer fitted with the paddle attachment. Let stand for 8 minutes. Add the flour and salt, and mix together on low until you get a dry, shaggy mixture. Add the eggs, one at a time, along with the sugar, beating between each addition. Switch to the dough hook attachment and beat the dough until you get a smooth dough and the bowl is clean (scrape down the dry bits stuck to the sides as you go to be sure that all the ingredients get incorporated into the dough). This will take about 3 to 4 minutes. Switch back to the paddle and dump in all the butter, and beat it into the dough. The dough will break down and become sticky and messy, but when it starts to form a more cohesive mass, switch back to the dough hook and beat on low (speed 2 on a KitchenAid mixer) for about 10 minutes or so, or until the dough is smooth and elastic, and the bowl is clean again. Butter a bowl and transfer the dough to the bowl. Cover with saran wrap. Let rise on the counter until it has doubled (I left mine for almost 3 hours), then punch it down to deflate, cover, and leave in the fridge overnight. The next morning, divide the dough into 8 pieces, and quickly roll them on the counter to make dough balls. Don’t work the dough too long or you risk melting the butter. Butter 8 slots of a muffin tin and place a dough ball in each. 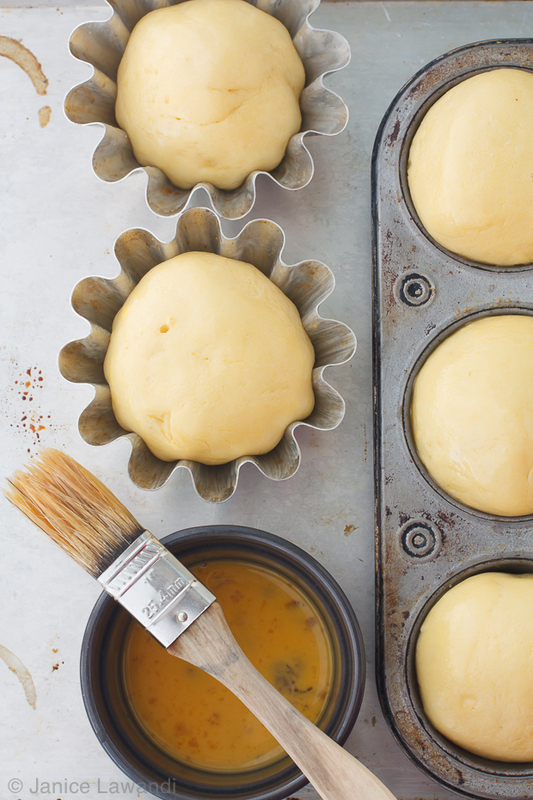 Place the muffin pan on a rimmed baking sheet and cover with a sheet of waxed paper. Put the sheet in the oven (turned off!) with just the light on. Let the dough balls rise until they have doubled (about 1.5 hours). When the dough has doubled, take the pan out of the oven and set it on the counter while you preheat the oven to 400ºF. Meanwhile, mix the egg with 1 tsp water and brush lightly onto each bun (there will be leftover egg wash—you don’t need to use it all). When the oven is preheated, bake for 15–20 minutes, until the tops are a deep golden brown. Let cool 10 minutes before unmolding. Serve warm with homemade jam or marmalade, and more butter, if you dare. I do my best to bake with the finest ingredients. Stirling Creamery, a Canadian company, has provided the butter for this post. Janice Lawandi is chemist-turned-baker, working as a recipe developer in Montreal, Quebec, Canada. She studied pastry at Le Cordon Bleu in Ottawa and cooking at l’Académie Culinaire. She has a BSc in Biochemistry from Concordia University and a PhD in Chemistry from McGill University. An absolutely delicious, calorie-laden treat! These look delicious! Your pics are gorgeous! This looks perfect! 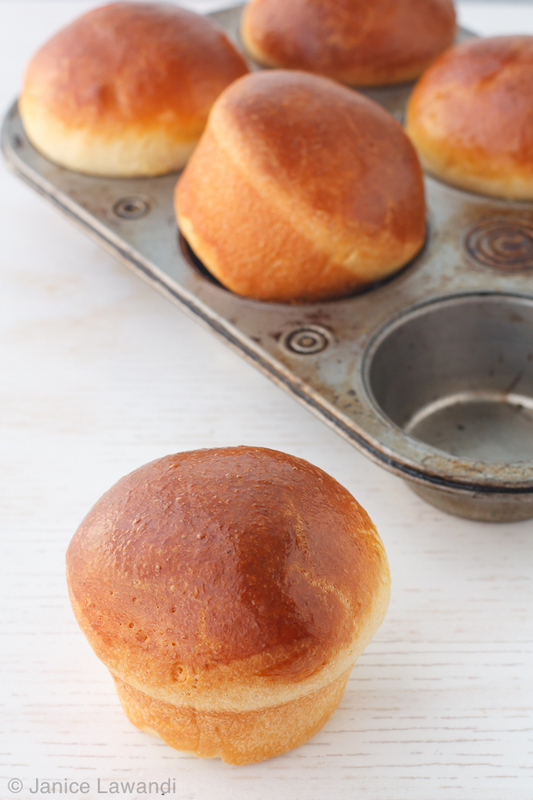 I’ve always made brioche as a loaf, never as buns.. I really need to try this recipe! I love that feeling when the kitchenaid is kneading the dough, the dishwasher is washing the dishes and I’m just sort of tidying up. I’m all “Me and my robot friends are hanging out in the kitchen! Doing the kitchen chores together” ..and that’s how I know I’ve been alone in the kitchen for too long. Love those robots to death though! Best friends for life! GET THE LATEST IN YOUR INBOX & A FREE RECIPE EBOOK TOO! © 2019 Kitchen Heals Soul. All Rights Reserved.